Fossa Hair + Esthetics has a new aesthetician/entrepreneur in their lower level Fossa Retreat. Jenn Murphy has just reopened the spa business for Fossa. Her opening special begins in November and runs for the month. (She told me there’s a chance she’ll continue i t into December, but I’d suggest booking early!) I was offered the chance to sample something from the Fossa Retreat November Promotion. In exchange for this blog post I received the 75 minute facial at the cost price for her materials. I have to say I would have paid full price for it, no problem! Jenn has the perfect touch – gentle with the waxing (I had my brows, lip and chin done) and firm for the massaging. I still feel relaxed and I had to walk back to my car for 10 minutes in the windy cold air! For my skin type Jenn did two different peels, extractions, used galvanic current to deliver oxygen to my skin to cleanse it further after extractions, and of course washed and moisturized my skin. The part I remember best is the rubberizing mask. After a ton of warm lovely applications and cleansers, this mask is cool and feels very odd on the skin. I quickly relaxed into the sensation however. It is designed to cover your entire face, including the eyes, but if you’re at all claustrophobic (and she’ll ask you before you even start any part of the facial) she won’t cover your eyes. The hot stone massage was amazing as well – I’d never experienced that before. So the facials are as follows: 60mins – 100$, that’s a customizable facial, including double cleanse, exfoliation, steam, extractions, hand and arm massage, custom soft mask, décolleté, shoulder and neck w/scalp massage, finishing eye and face cream, lip balm..
90mins – 135$, this is also customizable and includes everything above however it has upgrades to more advanced treatment plans. Peels, which are a 25$ upgrade to any 60min facial, as well when I bring in my new skincare line it’ll be advanced skin care treatments (rubberizing masks, firming/lifting, acne/oxygenating treatments, collagen, botinol, and vitamin C/antioxidant) most of these treatments require the extra time as well as the extra expense of the products within the treatment. The 75 minute facial is the same as the 90 min one, just fit into a shorter time frame (shorter massage sequences etc.) Jenn will look at your skin and use the products that she deems appropriate and most useful for you on that day. If you mention you read about this promotion on my blog, Jenn has offered my readers a free brow shaping along with the promotional product you choose! That was a pleasant surprise for me. I was very impressed by Jenn and the amount of knowledge she has about her products and skin care in general. She answered every question I had (and I had a ton!) and provided me with more information than I know what to do with right now. Once she get her skincare blog up and running I’m going to do a post just on her, her new blog, and her business – sort of a “feature” post. Subscribe to my blog so you don’t miss that! If you’re interested in booking something from the Fossa Retreat November Promotion, I’d so it soon. Jenn is still new but she tells me she’s not having too many quiet days. Fall is a great time to rejuvinate your skin and get some extra moisture on board before the dry winter months! 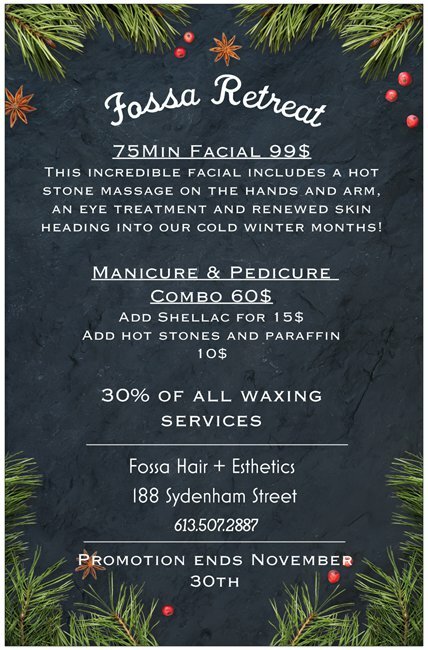 Call Fossa Hair + Esthetics today: 613 507 2887 to book now – and don’t forget to mention me (Jessica or A Modern Mom’s Life) for your free brow shaping!